Professional Endoscope + Digital Video Recorder provide an extremely convenient help to investigate damages, issues, and situation within a deep hole, pipe, or between rocks and stones. 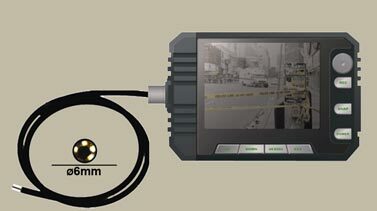 Endoscope DVR is an efficient tool for varied rescue and car fixing situation. With 4 white LED lights, the water-resisted Endoscope could help searching small units in between slice space and dark place. Insertion Tube & Light Source SPEC. Industrial Borescope Applications. A time saving and life saving tool! Rigid and flexible borescopes are a great way to visually inspect engines without having to dismantle the engine block, as they allow you to remotely visualize dark, small, and hard to reach places. Routine inspection with a borescope allow you identification of problem areas and to replace or repair parts before they cause a problem. Flexible borescopes can also be used to track through parts of a fluid or air system to find leaks or blockages in hoses. The places you can remotely inspect in an automobile are only limited by your imagination. Valves can be inspected for corrosion, integrity of seals, and regular wear & tear. Pistons and piston rings can be inspected for wear and leakage. Welds, castings and any other seals can also be remotely inspected, all this without having to dismantle the entire engine. The insides of rocker panels and bodywork can also be inspected for rust and damage remotely. Fuel lines and tank, as well as exhaust lines can be remotely accessed with a flexible borescope also. These are just some examples of the automotive components and spaces you can visualize using a flexible borescope. Adding to the benefits of borescopes, videoscopes have a camera built. 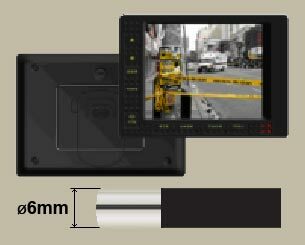 Videoscopes allow you to see the inspection in real time on a built in monitor, computer or TV screen, and can record still images and video of your inspection to show customers or for your own record keeping. Those recordings will help your customers to have a clear understanding of the repairs or corrective action needed in maintaining their vehicle. Industrial specialist can use videoscopes to inspect for cracks and flaws on finished products to decide if finished goods meet safety standards and customer specifications. Building technicans find videoscopes to be an excellent to inspect hard to reach crevasses and document damages before major repairs are undertaken. Law enforcement teams can discretely view underneath doors, into windows and more before making entry and keeping their team safe. In times of natural disaster, search & rescue team can save precious time by detecting victims trapped under debris. Security - covert views can be obtained in rooms with limited ambient light, observe tactical situations from a secure position, inspection inside car door panels, inside the compartment of metal walls of 20ft & 40ft containers & other hard to reach places for narcotics and other contraband items. Aviation - inspection of turbine blades, combustion chambers, airframe examinations and research, development and production of engines. Search - locating those who may be trapped in collapsed buildings as the result of various disasters, search and rescue operations.